I have a feeling that maybe, as a culture-consuming society, we’ve finally had our fill of zombie movies for the time being. Sure, they were innovative back in the day when George A. Romero et al brought them to the big screen in small doses, but that’s the key phrase: “in small doses”. Now, they’re everywhere from TV shows to video games to especially films, and each depiction of the undead that they bring is more or less exactly the same without many unique differences, making them – dare I say it – dull and predictable. I also feel that others are also latching on to this, because aside from The Walking Dead continuing to bring in the ratings, nobody has expressed any real interest in seeing another zombie reinterpretation on the big screen in this zombie-heavy side of pop culture. This could hurt the longevity chances of The Girl With All The Gifts, because although it’s probably the most thoughtful of these films in quite some time, strip it apart and you’re left with, big surprise, just another zombie movie. That, more than anything, might not give this film the strength to last as long as some of the other zombie classics, but then again I’ve been wrong before. Either way, I have decidedly mixed feelings about this film. In fairness, it starts off very strong; a young girl named Melanie (newcomer Sennia Nanua) lives in an isolated underground bunker, along with at least a few dozen other children. Every morning, she and the others are forced into wheelchairs with protective straps while army personnel point their guns at them and treat them with severe hostility (they refer to the children as “friggin’ abortions” and “it”). They are then transported to a classroom environment where a teacher, Gemma Arterton’s Miss Justineau, presides over their education. Melanie clearly adores her teacher, a notion shared by Justineau who takes great pity on her students, especially Melanie, but the stern and sometimes harsh Sergeant Parks (Paddy Considine) reminds her of what the children really are: carnivorous monsters that eagerly want the nearest human flesh. You see, humanity has – of course – succumbed to a mysterious fungal infection that turns people into flesh-eating “hungries”, and Melanie and the others are rare cases where they are able to retain human attributes while also having that fatal craving for blood and guts. Soon, the base is overrun, and a small group including Melanie, Justineau, Parks, and scientist Dr. Caroline Caldwell (Glenn Close) find themselves out in the open looking for a new place to take shelter. It was honestly around this point that the film started to lose me a little bit. Up until the “hungries” – who I’m just going to call zombies from now on, because unlike this movie I will not succumb to the YA trope of renaming something that already has a name – actually show up, it was a gripping and sometimes even provocative watch. For the first ten or fifteen minutes, you’re wondering why the hell all these adults are acting so horribly to these children, particularly Melanie who at first seems to be a polite and well-mannered young girl, and why they are being forced into a totalitarian and prison-like way of living. Even after the reveal that they’re more monstrous than first let on, I was still extremely curious to find out more about what led them to be in this situation, and why they are still capable of human emotions despite their desire for human flesh. For this entire first act, I was completely sold and very eager to see where the movie was going. Where the movie goes, is in the same direction as countless other zombie movies you’ve seen before. You have the overgrown landscapes of city areas, you have the hordes of zombies waiting around every corner, you have the ragtag group of survivors complete with a desperate scientist and a stern military leader, and pretty much everything you know a zombie movie like this needs to have. I had such a problem with identifying these clichés that it honestly took me out of the film for quite an extended period of time, and it became difficult for me to properly enjoy what is honestly not that badly made of a film, since I was more distracted by the familiarity of it all. There are characters who, once placed in certain situations, I could immediately predict that sooner or later, they would meet their maker, which isn’t helped by some of the rather stupid decisions that they make over the course of the film. I wouldn’t mind so much, if the characters were a little more interesting, but they’re really not; the only one who you’re actually engaged with is Melanie herself, and apart from her being a likable enough character, newcomer Nanua delivers a solid, career-making performance that’s lively and intuitive, as a kid should be. As for the others, they’re really just the stock characters you’re predicting they’re going to be, and although the higher-profile actors like Glenn Close, Paddy Considine and Gemma Arterton are fine here, they are given characters to play who I ultimately didn’t really care about. I really wanted to love The Girl With All The Gifts, especially after reading some rather enthusiastic reviews about it. Unfortunately, there turned out to be just too many zombie movie clichés for me to fully enjoy it, and while I certainly give props to writer Mike Carey, who adapts from his own novel, and director Colm McCarthy for at least trying to give this one a little more weight to it than the standard zombie movie, it’s still a zombie movie, and unfortunately it’s not one that reinvents the game as much as it thinks it is. 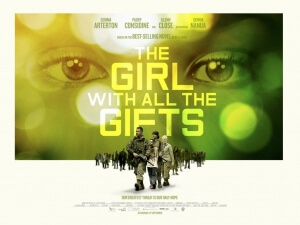 The Girl With All The Gifts has more ambition than a lot of other zombie movies, but despite a solid first act it still succumbs to a distracting amount of zombie movie clichés that make it difficult to fully enjoy this film for what it is.